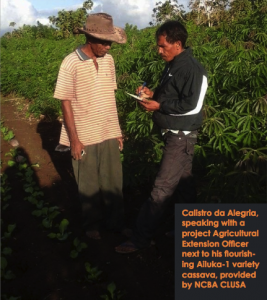 In partnership with the Cooperative Café Timor (CCT), the primary objective of the project is to link smallholder farmers in lowland areas of East Timor with international markets, contributing to increased trade and rural income. The target crops – Robusta coffee, cocoa, cassava, black pepper, cloves and vanilla – have been selected because they are in high demand globally and have the potential to perform well in the targeted areas. Within four years of planting seedlings, farmers adopting these crops are expected to increase their incomes by 50%. This will be accomplished through the introduction of improved planting material and training in crop specific production and building sustainable supply chains including storage, transport and processing facilities. Three of the crops – commercial fruit, cassava and moringa – will also contribute to household food security beyond providing income. CCT has also begun a cassava milling plant to provide a market for cassava growers. The flour, which can replace imported wheat, can be sold at half the price. 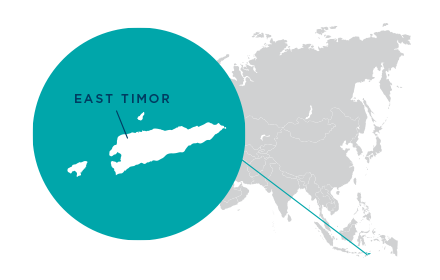 Ervina Morais lives in the small village of Fuiloro in the far eastern side of East Timor. She has four children and is the main income earner in her home. Though she has no land, Morais took advantage of the opprotunity to raise seedlings to sell to farmers by starting a nursery behind her home. Bringing women in to the production chain process is a cross-cutting strategy for NCBA CLUSA programming. While Morais did not have land to farm, she did have enough space to develop her own nursery, add value to the seedling market, and developed new business skills through training. 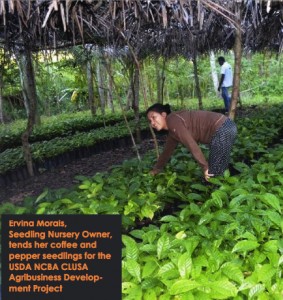 With the ongoing guidance of NCBA CLUSA’s Agricultural Extension Officers, she works to grow 5,000 Robust coffee seedlings and 100 Black Pepper seedlings. Nurturing her own talent for gardening, she build a pandanus palm shade structure to keep the seedlings healthy.